Domenico Ghirlandaio, An Old Man and his Grandson, ca. 1490, Tempera on panel, 62.7 x 46.3 cm. Louvre, Paris. Ask me what my favorite painting is — a very hard question since there are so many — and I’ll eventually come up with An Old Man and his Grandson by Domenico Ghirlandaio. The old man with his weathered face looks down kindly at a little boy, who looks back up at him trustingly. It’s a kind of meditation on the seasons of life: the old sheltering the young, the wisdom of the elder guiding the youth. 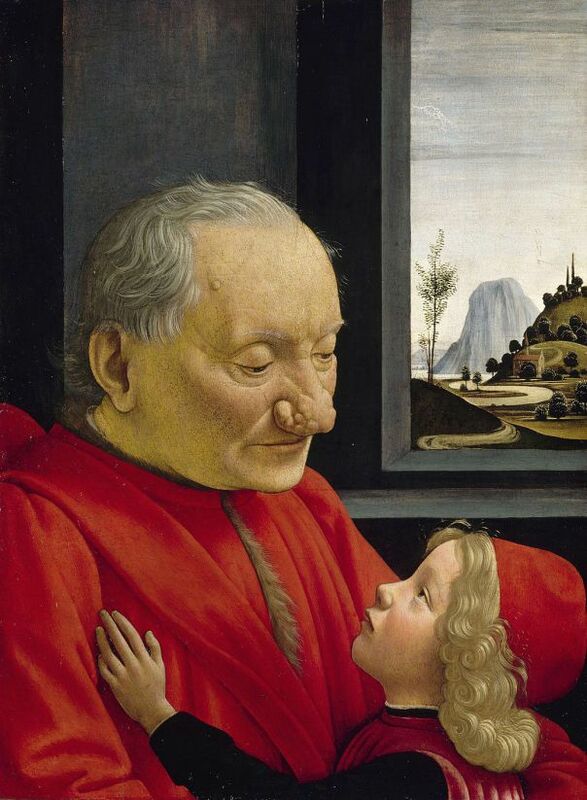 The contrast between the child’s smooth face and tiny features and the old man’s weathered visage is striking. Outside the window, there is a lush, stylized landscape that gives way to a kind of pale glacier beyond. A metaphor for aging? Generally, the painting is very simple: black and red, architecture and cloth. Window. There is nothing else here to compete with the main event or to complicate the story. But what’s strange about the painting are the lumps on the tip of the old man’s nose. Barthes describes the punctum as the rupture, the piercing; in this case the unexpected detail that mars the classical, standard and predictable, giving the picture its humanity. The studium is the expected, the archetypal, the idealized — landscape, portrait, figure. The punctum wakes the viewer up, brings her into the moment, the present, the here and now. For me, the punctum in this painting is the sight of the rounded forms on the old man’s nose, which echo the spherical mole on his forehead. His nose, rather than being an expected shape, has the addition of a few more shapes on top of it, almost becoming comical, like a clown wearing a false nose. But it miraculously stops short of ugliness as we know it, or hilarity, or pathos, or shock. 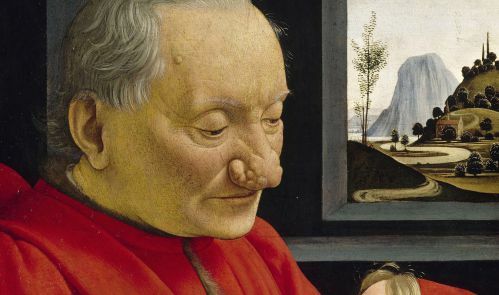 The specificity of this particular nose — the artist’s careful analysis of the forms and how they are arranged, bundled together on top of the larger ball — this is what tells us that this is a portrait: that this nose belonged to this old man and no one else. The bumps, so unexpected, remind me of other forms on the body. They could even call to mind breasts, in all their variations, the way skin can gather and bulge; the unexpected forms when scars are present. Unexpected configurations of flesh on the body always draw attention to themselves as abstractions. They don’t carry the weight of recognition that normally burdens the body. Mixing it up, being surprised, makes us see, instead: a pucker of skin that looks like paisley. A bulge of flesh that looks, next to other bulges, like the petals of a flower. A waterfall of wrinkles. A half-circle mound that is like a mountain. The belly like a loaf of bread. The child is the embodiment of the viewer, looking upon that other face (his own face fresh, innocent) with love: it could be a one-liner, easily dismissed, saccharine, even. Too sweet. But it gets me every time. The beauty of that nose, at the center of the story. Deviating from the norm. Making us question what the norm is or what we thought it was. We don’t love the studium, though we may admire it. We may zone out in the comfort of the expected, the familiar. We like it. But we love the punctum. We love through specificity. 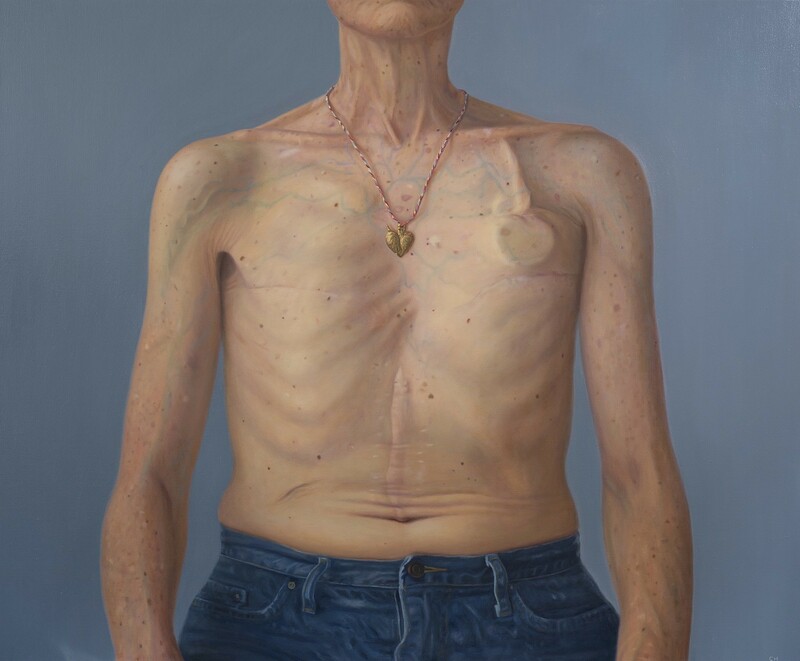 Clarity Haynes is an artist living and working in New York City whose paintings explore portraiture and the body. Her work can currently be seen in the National Portrait Gallery’s “Outwin 2016: American Portraiture Today”, in Washington, DC, through January 2017. www.clarityhaynes.com.